This week’s recipe for French Fridays with Dorie is Nutella Tartine. A tartine is an open-faced sandwich, French-style. 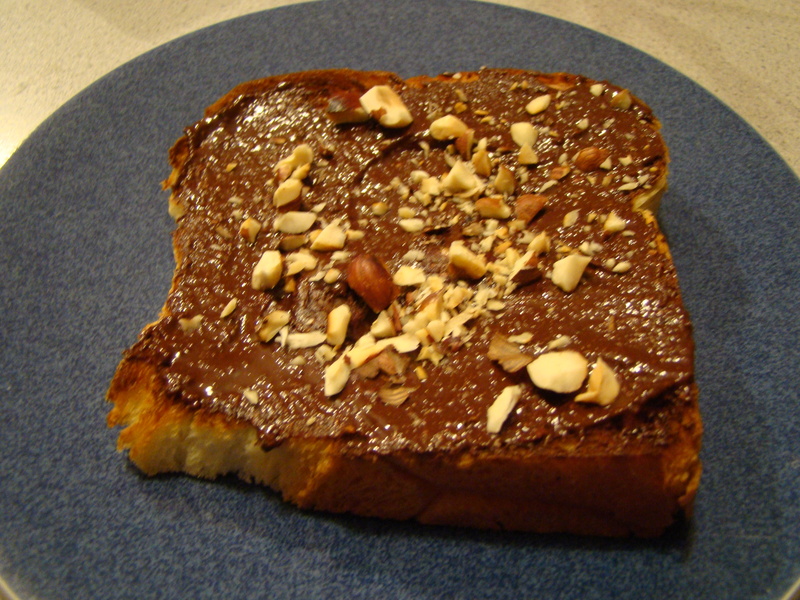 I think tartines are usually savory, but a nutella tartine is a typical after-school snack for French children. 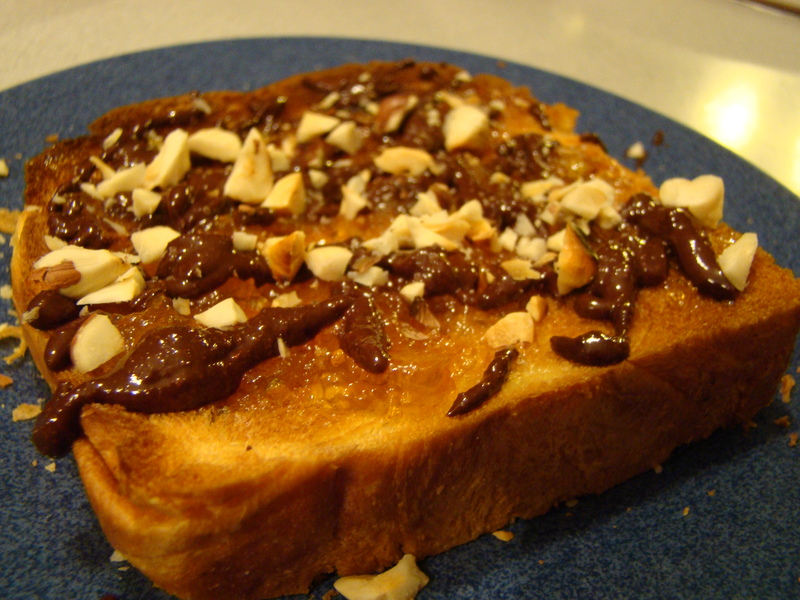 For Dorie’s version, the main event is really orange marmalade spread on a thick slice of challah and then drizzled with nutella and sprinkled with some sea salt and chopped hazelnuts. The bread remains soft because it’s just toasted on one side, the spreading side. The recipe was so simple, that it almost seemed like cheating. So, I thought it was a good opportunity to try out one of the recipes for homemade nutella that I’d seen. This was a good idea in theory, but when the melted chocolate cooled, it was no longer spreadable. I have to chip it out of the jar with an ice cream scoop. It gets soft and spreadable again when heated, but was not what I expected. I used bittersweet chocolate instead of milk chocolate because that’s what I prefer. I don’t know if that’s what made it harden up. I think some of my husband Howard’s food quirks have rubbed off on me. I don’t really like chocolate mixed with fruit flavors. So the flavor combination of the orange marmalade with the chocolate-hazelnut drizzle didn’t work for me. I had a whole loaf of challah and the jar of homemade nutella, so for round 2, I tried spreading the nutella on the bread and sprinkling with chopped nuts and salt. Time for true confessions: I don’t like peanut butter on bread. I like it on a spoon or on something wet, like celery or apples, but not on bread. I know, this post is supposed to be about nutella, but it matters. Nutella is chocolate-hazelnut spread. Sort of like peanut butter, but with hazelnuts instead plus chocolate. The conclusion, I don’t like nutella on bread either. At the same time, I’ve always been fascinated by this European concoction. One Valentine’s Day, I used it to sandwich heart-shaped shortbread cookies together, but other than that I’ve never been able to figure out exactly how to use it on a more regular basis. Any suggestions for using up the rest of my jar of homemade (and hardened) nutella? One more helpful tip I wanted to offer up this week. I’ve never had much luck getting the skin off of hazelnuts just by toasting and rubbing with a towel. I seem to get less than 25% of the skin off that way. I saw a different method on TV that works like magic. In a large pot, dissolve 3 tablespoons of baking soda in 2 cups of water, and bring the water to a boil. Add up to a cup of hazelnuts, and boil for 3 to 5 minutes. The mixture will bubble up and look disgusting. The water will turn black. It’s ready when you can run a nut under cold water and the skin comes off. Drain the nuts in a colander and run cold water over them to cool. Now, rub them in a towel. The skin will come right off. Just be sure to use a much bigger pot than you think. The mixture will really bubble, and you don’t want it to overflow. It’s a mess to clean up (I speak from experience). Each Friday, I make a recipe from Dorie Greenspan’s book Around My French Table along with other bloggers. If you want to see their take on this recipe, check out the links at French Fridays with Dorie. Posted on 10 February 2012, in French Fridays with Dorie and tagged French Fridays with Dorie, nutella. Bookmark the permalink. 25 Comments. we make crepes with nutella as a snack at our house. (i use store bought nutella) we think it is easy and yummy. definitely not the same as eating it on bread (more dessert like) I want to clarify to those who read this that i am the sister-in-law who does not cook. i just enjoy reading about those who cook!! Warm up your homemade Nutella and pour it over ice cream! I’m impressed you went two rounds with this considering you don’t care for fruit and chocolate. And, thanks for the great tip about the hazelnut skins! What a wonderful tip for skinning the hazelnuts! I will use it for almonds – Eduardo has been asking for macarons (couldn’t he ask for something easier?!) and the cost of almond meal is almost prohibitive in PR. I also had problems melting the Nutella and thinned it out with a bit of milk. Good tip for getting the skin off hazelnuts. What a disappointment that your homemade nutella hardened up! I’d be peeved. Sorry this wasn’t a hit for you, but good for you for trying it, even though you already knew you don’t like pb on bread. Oh well. Onward! Great tip! I have never had much luck with the towel method either. For this recipe I was just lazy and didn’t bother to skin the nuts. I figured there weren’t that many of them so it wouldn’t make much of a difference. Yum! It did feel like cheating, didn’t it? :) I’ve added Nutella to so many things – cakes, cupcakes, frosting, cookies, etc. – but I love Candy’s idea of pouring it over ice cream! I’m not a big lover of Nutella but a little bit drizzzled on top of the tartine with the other flavors was pretty good, I thought. Thanks for the tip on getting the skin off hazelnuts, you can buy them skinless but costs an arm and a leg, ha ha, not worth it! I think Nutella is at its best spread in a warm crepe! I’ve also spread it on cookies but I think it sounds great over ice cream. My Nutella didn’t really melt to drizzle consistency until I added water. I DO like Nutella on bread, but I did not like the flavor combination of the marmalade and chocolate/hazelnut spread either. We have a lot of Nutella on fruit! (bananas, apples, I have even seen a grape or two dipped in it). One of my favorite treats is to use it to make “hot chocolate” – heat a cup of milk (almond milk is nice here too) in a small saucepan, stir in a 1/4 cup of your spread and continue gently stirring and heating until everything is melted and smooth. So good. I have good experience with both taste and texture with David Lebovitz’s version of homemade Nutella. Perhaps you may want to give it a try next time? As for your leftover jar, it makes for great pie filling especially one that is served warm or room temperature. It’s too bad this snack doesn’t appeal to you. Excellent tip for the hazelnuts! Thank you! I’ve been buying them skinless, but its very expensive even when I can find them, and I have some with the skins on that I’ve been meaning to use (I skipped this week). Great tip on getting the skin off hazelnuts. Would have never known but for your interesting fact! I’m not able to eat Nutella, but this didn’t get a rave review from my spouse so it won’t be making another appearance. Thanks for the hazelnut hint. I think you should give yourself credit for making your own nutella, and for trying the snack, even though you had reservations. Sometimes a recipe that sounds doubtful turns out to be a winner–and sometimes it turns out you were right to have your doubts! Well, you get points for all your efforts. My kids really like Nutella, however, my mindset is that it is dessert, not a bread spread…guess I’m not European. I’d say anything that uses hot fudge sauce could use Nutella. I’m making a fresh fruit tart for Sunday dinner and will drizzle hot fudge and caramel sauces over the top…probably would be good with Nutella too. Or something like strawberries dipped in it. When I don’t love things I make I just give it to my grandkiddies…they eat everything. Maybe your dark chocolate did not work as well as it has less oils? Maybe yours just needs a little cream or butter added to soften it a bit? Good luck. I agree about the points you get for your efforts. I also give extra credit points for “keeping it real” and saying when a FFWD recipe did not fly for you, regardless of the reasons. And after I read that you do not care for peanut butter on bread I figured that you had little chance of liking this combo. But you did an amazing job trying it all and I ended up feeling even lazier about how I flew through this recipe myself :) Great post ! You are special to make this even though your didn’t expect to like it. It looks good and I am sure a marmalade/Nutella fan would have loved it. I think just spreading the chocolate on sounds great! The warmed-up Nutella didn’t drizzle really well for me. I’m actually not a huge fan of orange and chocolate mixed together! :) But then we accidentally used apricot jam instead so this worked out great for us. I always have a problem with the skins of hazelnuts…thanks for the tip. I happen to love Nutella by the spoonful or on anything at all! I have wanted to make my own for some time now. Sorry this one was not for you.